Don’t know what you are passionate about? 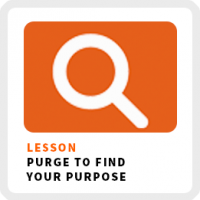 Purge to find your purpose. When you want to make a big change in your life like working for yourself, it can be so overwhelming and even more so when you don’t have a sense of purpose about what it is you want to do. I’m going to give you some unconventional advice about how to rediscover what you really care about. Purge your life. Clear it out. Let go of all the stuff that no longer energizes you. I’ve interviewed 500+ who have figured out how to work for themselves and a common first step they all take to figure themselves out is to do some sort of purge. How does the transformational magic of purging work? Let’s use your bedroom as an example. When you get rid of everything in your line of sight that doesn’t energize you, no longer has any meaning to you or you haven’t used in months, all that’s what’s left behind is all the stuff that you really care about. Those possessions start providing you with a clue about how you live you life and what’s important to you. Obligations like meetings, memberships to organizations and even ongoing help you’ve been giving family or friends that really don’t need it any longer. Digital content like text messages, apps on your phone, your email inbox, photos, documents, etc. Relationships with friends and colleagues who are no longer on your path, but hang onto them because they are familiar and because you have a shared history. Spend less time with people who aren’t helping you grow. Don’t do it all at once. Pick one group of related items at a time like your shoes, books or your kitchen utensils. If you haven’t used something in a year, you aren’t going to use it again. Don’t save it for a future emergency that most likely will never happen. Start with the less emotional stuff first to get into a groove of purging. Avoid personal mementos, photos or even your clothes at first because your emotional attachments will only slow you down. Write down how you feel as you purge. What patterns are you noticing? What thoughts are crossing your mind? The act of getting rid of stuff combined with writing about it, forces you to reflect on your life and where you want to go. Doing a purge is a metamorphosis of yourself. You are shedding your old self, your old interests and your old support network, so you can grow into new interests and a new community of people who will support your new identity. Gotta break yourself down before you build yourself back up!